It's Martin Luther King Jr. Day and I'm not sure how I can talk about anything else besides the great doctor's impact on Nichelle Nichols. If you've never heard the story before, basically, Nichols had turned in her resignation to Roddenberry after the first season. King, a huge Star Trek fan, convinced her not to quit. He told her that what she was doing was important. That she was playing, for the first time on TV, a non-stereotypical role. Because of King's words, Uhura stayed on Star Trek beyond that first season and for several movies. I remember hearing this story when I was a kid. It was easy, then and now, to see how Nichols could inspire young girls. 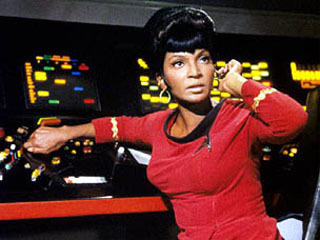 Uhura was an important member of a crew in a future with equal opportunities for all genders and races. Nichols might not have been delivering speeches and heading up historic marches but, by beaming into millions of living rooms in 1967, she was influencing, inspiring, and bringing hope to kids at a time when this country was tearing itself apart. I'm so very glad that, on that day, at that NAACP event, Dr. Martin Luther King Jr. sought out Nichols and said to her, "I'm a Trekker. I'm your biggest fan." I never knew this! So awesome! Thanks for a unique MLK Day story! I remember when I first heard about this. When a great man like Dr. Martin Luther King Jr. tells you you can't quit, what else can you do but stick with it?